Over the past 50 years, natural and anthropogenic radionuclides have been instrumental in addressing many important questions in oceanographic research. Yet knowledge gaps remain regarding their spatial and depth distributions and the temporal evolution of many radionuclides of importance to both oceanographic and human health issues. The Fukushima Dai-ichi disaster has also recently heightened public and policy concerns related to the human health effects of radioactivity attributable to external exposure from ocean contact and internal exposure from seafood consumption. The timing is thus right for a new SCOR Working group- “Radioactivity in the Ocean, 5 decades later”. The goals of RiO5 are to synthesize in a series of papers, the latest scientific insights that have been gained from new global databases on natural and artificial radionuclide distributions, and to identify gaps in our current understanding and scientific knowledge of marine radionuclides. We also plan to create an online compilation of papers and lectures related to radioactivity in the marine environment that will assist in the education and training of the next generation of marine radiochemists and radioecologists. At the same time, we will develop tools to enhance public understanding of radioactivity. Finally, we will assist in the organization of an international symposium that would bring together academic, nuclear power industry and national laboratory experts working in this area. The very first SCOR Working Group #1, entitled Radioactivity in the Ocean, was formed in 1958 and met in 1959. Chaired by the Japanese scientist, Dr. Yasuo Miyake, the primary objectives of WG1 were to standardize and improve analytical methods and coordinate world-wide measurements of artificial radioactivity. Indeed, when referring to radioactivity, most still focus on the immediate detrimental impacts of anthropogenic radiation and issues related to contamination. Yet since that time, there has been considerable advancement in the field of marine radioactivity, not only in the measurement and application of artificial radionuclides, but also of cosmogenic and U-Th series radionuclides to study ocean processes. Several SCOR WGs have taken advantage of these advances, such as in the use of thorium-234 as a particle export tracer (WG#116) and radium isotopes in the study of submarine groundwater discharge (WG#112). 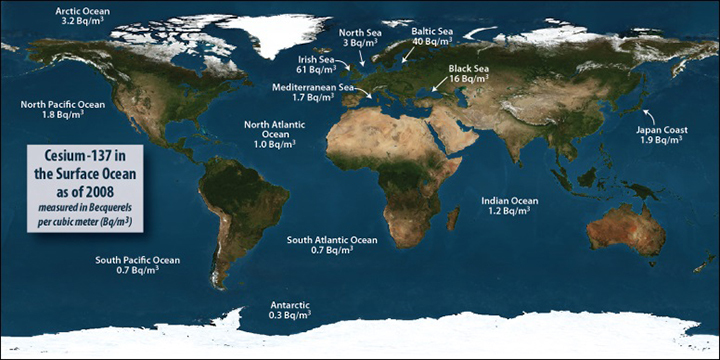 Many other radionuclides are instrumental in geochronology (210Pb, 14C, 137Cs) or in studies on present and past ocean circulation (3H, 129I, 230Th/231Pa). Regardless of the application, it is necessary to understand: i) the evolution of radionuclide sources (both natural and anthropogenic) over a range of temporal and spatial scales, ii) how to use their inherent geochemistries and decay rates to answer a wide range of oceanographic questions and iii) the potential human health effects of radionuclides in the marine environment. We propose a SCOR Working Group to look at Radioactivity in the Ocean, 5 decades later (RiO5). RiO5 would provide a comprehensive evaluation of our current knowledge of radioactivity in marine systems. RiO5 would be comprised of an international consortium of radiochemists and ecologists whose major focus will be on increasing scientific and public understanding of the sources, fate, and applications of natural and artificial radionuclides in marine systems. This will be accomplished through updating and improving access to radionuclide databases, providing a synthesis and review of radionuclide distributions, and developing a strategic plan for filling missing knowledge gaps. The timing is right for RiO5 for many reasons. In the aftermath of the Fukushima Dai-ichi disaster – and after years of relative complacency – the public and policymakers have new, heightened concerns about radioactive contamination and potential human health concerns. We are also still limited by where radioactive wastes may be stored, due to perceived and real threats to environmental safety. Nuclear-fueled ships and submarines ply our oceans. The number of nuclear power plants worldwide (>430) is expanding in many countries and is likely to continue as we replace other forms of power that produce greenhouse gases. There are continued concerns regarding the spread of nuclear weapons and “dirty” bombs. Yet, at the same time, Cold War-era nuclear scientists and radiochemists have retired, creating a need for training the next generation of marine radiochemists and radioecologists. As this is happening, a new global view of natural and artificial radionuclides is emerging through programs such as the SCOR sponsored international GEOTRACES program. Although the isotopes measured by GEOTRACES are a limited set, this is the first such effort since the GEOSECS Program that mapped several radionuclide distributions in the oceans in the 1970’s. Indeed, the time elapsed between both major efforts appear as a unique opportunity to examine not only how specific radionuclide inventories have changed, but what those inventory changes mean with regards to their marine geochemistry and implications for global biogeochemical cycles (e.g., Moore et al., 2014). 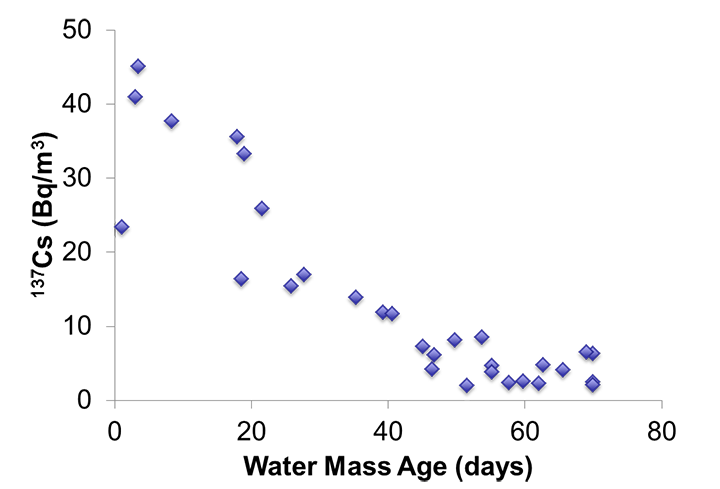 One example of the value of such a review of current knowledge is shown here by summarizing the global distribution of 137Cs in the surface ocean (Figure 1). One can immediately observe the following: 1) 1960’s fallout 137Cs is rather uniform globally, with slightly higher values in the Northern Hemisphere (due to location of weapons testing) at background levels of 1-2 Bq m-3; 2) higher levels from Chernobyl fallout in the Baltic and Black Seas (20-40 Bq m-3); and 3) perhaps the most surprising, or at least less well known, is that the Irish Sea still maintains the highest 137Cs levels in the ocean due to prior nuclear fuel reprocessing releases from Sellafield. This map further enables the establishment of a baseline for oceanic 137Cs activities prior to Fukushima. In contrast to these levels, 137Cs in the ocean peaked at over 50,000,000 Bq m-3 close to the reactors in April 2011 (Buesseler et al., 2012), which was of direct concern to human health and marine biota, and far higher than the concentrations observed after weapons testing or the Chernobyl accident. Three years later, the public remains concerned about the predicted 137Cs activities of 10-30 Bq m-3 within the Fukushima plume approaching the west coast of North America (Rossi et al., 2013). However, these predicted activities are in fact lower than that found today in some of the world’s oceans and should not cause any measureable impact on human health. Compilations of global baselines such as that shown in Figure 1 are clearly necessary and allow for such assessments to be made. This and other maps are part of the first steps of RiO5. 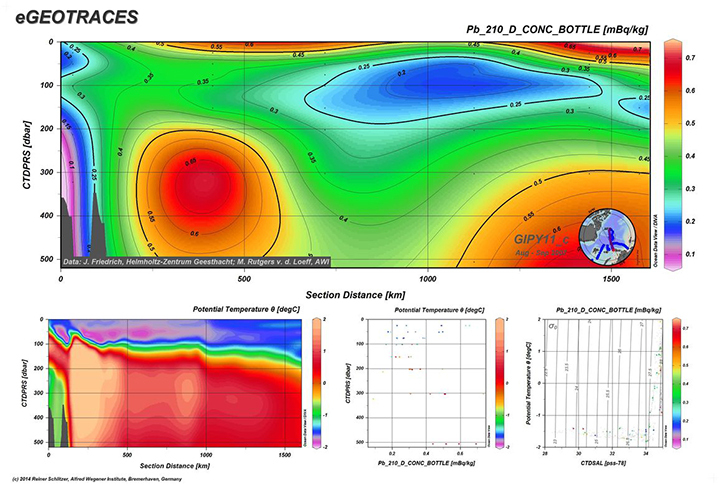 Figure 2 is an exciting example of a natural radionuclide data set only recently available online as part of the GEOTRACES Program. While variable and high dissolved 210Pb activities in surface waters are expected due to atmospheric inputs, high activities of 210Pb at depth not only suggest substantial remineralization of sinking particles, but an additional source of 210Pb that has not been previously observed (using mass balance). Such profiles therefore demonstrate how 210Pb may be used to examine sources and cycling of other stable trace elements of similar particle reactivity that are more difficult to assess from their concentrations in seawater. A final example showing the strength of pairing natural and artificial radionuclides is from Charette et al. (2014), who used 224Ra as an indicator of coastal water ages (time since contact with sediments and/or groundwater) and found that in samples collected in 2013, the activities of 137Cs near the coast of Japan remained higher than those offshore, similar to 224Ra. Using a mass balance approach they estimated that continued release of 137Cs from the Fukushima NPP site must be occurring (9 GBq per day), a key unknown in the ongoing evaluation of Fukushima ocean impacts. These examples illustrate the breadth of new insights obtainable by synthesizing current radionuclide data sets (Figure 1); exploring new features in global transects (Figure 2); and combining studies that include both natural and artificial radionuclides (Figure 3). In addition, tremendous technological developments over the past decade have enabled the measurement of natural and artificial radionuclides at previously unattainable levels. This has revolutionized the radiochemistry field and has been instrumental in discovering new applications of radionuclides to address many important questions in oceanographic research. RiO5 will bring experts together to review the current knowledge of radioactivity in marine systems and explore and identify research areas where new uses of radionuclides as tracers will be instrumental. These processes include: 1) understanding the global ocean carbon cycle with regards to sources of carbon to marine systems (gas exchange, riverine and ground water, hydrothermal vents, etc.) , in situ cycling (nutrient turnover), the transport of material from the surface ocean to depth (biological pump-mediated particle export and remineralization), and burial in marine sediments (months to millennia); 2) understanding ocean circulation in current and paleo climates from coastal ocean currents to large-scale tele-connections between various ocean basins; and 3) understanding contaminant sources, transport and removal of not only the radionuclides themselves, but other elements of similar chemistries, such as bioactive and particle reactive trace elements measured in the GEOTRACES program, some of which have their own pollution concerns (Pb, Hg, Cu, etc. ).